Naturally occurring iron metal is exceedingly rare on the surface of the Earth. Thus, it is little wonder that civilizations dating back thousands of years used iron meteorites—naturally occurring alloys of Fe, Ni, Co and a variety of trace elements—to manufacture knives, fishhooks, adzes, and amulets, among other objects. Perhaps the best known of these is the meteoritic metal blade of a dagger found with the mummified body of King Tutankhamun (Egypt’s 18th dynasty boy pharaoh who ruled ~1332–1323 BC). Unfortunately, the rarity of these materials typically makes it impossible to apply destructive techniques that might allow researchers to not only confirm a meteorite origin, but also identify the meteorite used during manufacturing. Fortunately, the inhabitants of what is today the central United States produced meteorite artifacts in abundance, allowing for the kind of analyses that provides clues to 2,000-year-old trade routes. Exotic materials, including copper, silver, obsidian, mica, and shells, and the building of mounds, including earthworks and burial mounds, are a hallmark of the Native American Hopewell culture (~400 BCE to 400 CE) (Prufer 1961) within the Middle Woodland period in eastern North America. The sources of these materials span much of eastern North America: shells from the Gulf of Mexico, silver from Ontario (Canada), obsidian from modern-day Yellowstone National Park. Although a volumetrically miniscule proportion of the artifacts, meteoritic metal represents the most exotic and traceable of these materials. Artifacts of iron metal were first recognized from Hopewell sites in modern day Ohio (USA), including from mounds near Chillicothe (Ohio). The famous Tiffany and Company gemologist George F. Kunz (1856–1932) first suggested a connection between numerous Hopewell artifacts from Ohio, including beads and adze blades, and the Brenham (Kansas) pallasite meteorite. Kunz based his hypothesis on the shape of the included olivine crystals and the relative proportions of metal and olivine in this stony-iron meteorite. A definitive connection between Ohio Hopewell meteoritic iron and the Brenham pallasite finally came with the advent of instrumental neutron activation analyses of meteoritic irons. By determining the trace-element chemical composition of both the artifacts and the metal within the Brenham meteorite, Wasson and Sedwick (1969) convincingly demonstrated a match. Figure 1. Two Havana (Mason County, Illinois) meteoritic metal beads with a 1 cm cube for scale. The bead on the left is cut perpendicular to the central hole, illustrating the extensive alteration of the bead and infilling of the central hole. The bead on the right is cut parallel to the central hole and exhibits a concentrically deformed structure. Photo: Smithsonian Institution. A significant impediment to a full understanding the importance of meteorites in Hopewell culture is the absence of a confirmed relationship between any other Hopewell meteoritic artifact and a known meteorite, other than the Ohio Hopewell–Brenham link. In the summer of 1945, the Illinois State Museum excavated a group of mounds in Mason County (Illinois) about 1.5 miles south of the town of Havana and identified a bead string that contained 22 meteoritic iron beads interspersed by shell beads (McGregor 1952). Wood from the same mound yielded an age of 2,336 ± 250 years BCE, which is consistent with ages for the Ohio Hopewell sites. In the meteoritic metal beads (Fig. 1), alternating bands of low-Ni kamacite and high-Ni taenite are heavily deformed and roughly concentric to the center of the bead. The outer surface and inner hole are filled with limonite. The Havana beads are chemically grouped with three North American iron meteorites: Anoka (Minnesota); Edmonton (Kentucky); and Carlton (Texas). Among these, Anoka was found as multiple masses on opposite sides of the Mississippi River in Anoka and Champlin, Minnesota. Coupled with the fact that the Havana site occurs along the Illinois River, a tributary to the Mississippi, warranted further investigation of the similarity between Havana and Anoka. To this end, both materials were analyzed for major, minor, and trace elements by electron microprobe at the Smithsonian Institution (Washington DC), by laser ablation inductively coupled mass spectrometry at the University of Maryland, and by instrumental neutron activation analysis at the University of California at Los Angeles. The Havana beads and the Anoka iron were found to be remarkably similar in chemical composition, with most elements within 10% of each other. Exceptions were elements that were concentrated in the phosphate mineral schreibersite (P, Ag, and possibly W) and elements that may have been contaminated by other artifacts (e.g. Cu). This finding is also consistent with the idea that schreibersite—a mineral that cross cuts Anoka and is more brittle than the surrounding Fe–Ni metal—may have provided a mechanism for removing portions of the meteorite to shape the beads. The beads were made by cold-working the metal into strips and then joining the ends to form a hollow, tubular bead (Fig. 2). Staff at the Smithsonian Institution, including myself, also undertook a bead-making experiment using a wood-fueled fire for heating and using lithics (rocks) for deformation, simulating contemporary Hopewell technology. Thinning was achieved by three cycles of heating for ~15 minutes in a red-orange wood-fueled fire interspersed with periods of deformation by the lithics to produce a final sheet 2–3 mm thick. This sheet could easily be fashioned into a cylinder by hammering it around a twig. 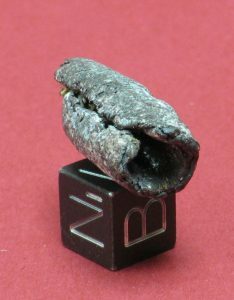 The cylindrical bead so-produced shares a number of similarities with the Havana bead, including the degree of curvature and deformation of the Widmanstätten pattern and the fragmentation of the schreibersite. The movement from source to final location for these meteoritic beads provides an interesting test of the competing models of trade that was engaged in by the Hopewell peoples. The movement of material between Hopewell sites has been envisioned in one of two ways. The first is as a regularized exchange system by which material moved through multiple exchanges before reaching their destination: the so-called Hopewell Interaction Sphere described by Struever (1964). The second is as long-distance logistic trips to sites of known resources: the “one-shot” model of Griffin et al. (1969). While most of the exotic materials (e.g. obsidian, mica, copper) used by the Hopewell occurred in abundance at their sources, that is not universally true of meteorites. The Brenham meteorite, which is the source of the meteoritic metal beads identified at the Hopewell mounds in Ohio, has produced many tons of material up to the present. As such, the idea that an expedition might visit that site for the specific purpose of returning material to Ohio seems tenable. Figure 3. Map of the central United States of America. Locations of Hopewell culture Native American archeaological sites are indicated by open circles. Image: Smithsonian Institution. In contrast, the beads identified from the Havana mound almost certainly originated from a single mass. The Havana mounds were located along the banks of the Illinois River, a tributary of the Mississippi River, and the Anoka meteorite fell near the Mississippi River (Fig. 3). In this case, the idea of exchange seems more likely. The Havana Hopewell center likely interacted with both the adjacent Trempeleau Hopewell, which extended from southwestern Wisconsin up the Mississippi River to the find site of the Anoka meteorite, as well as the more distant Ohio Hopewell, which centers on southern Ohio. 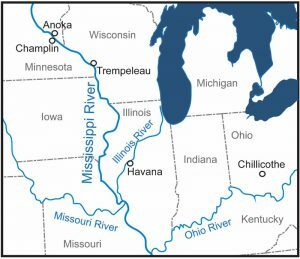 The connection of the Trempeleau and Havana Hopewell via the Mississippi River further supports the hypothesis that the Anoka mass was recovered by the Trempeleau and, ultimately, traded to the Havana center.